California's Highway 1 is the centerpiece of West Coast road trips. 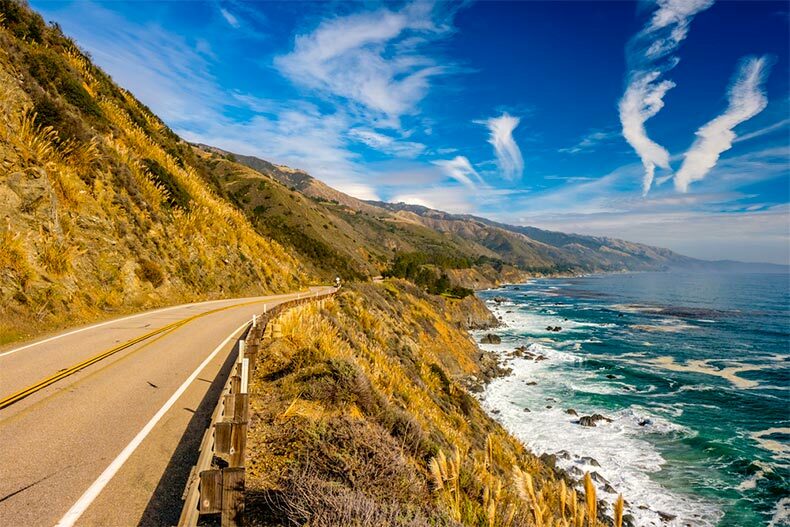 With a coastline that stretches over 800 miles, California offers some of the best road trips in the United States. Road trips along this drive provide views of the rugged coastline, seaside forests, and Southern California’s vibrant beach cities. While there’s no wrong or right way to travel California’s coast, you’ll definitely want to check out these must-do west coast road trips. For those wanting to explore Southern California, San Diego is the perfect spot to begin. Situated at the southern end of the state, San Diego is home to beautiful beaches, cultural attractions, and many historical sites. Once in San Diego, it’s worth taking a trip to the historic Old Town neighborhood, which is considered the birthplace of California. Balboa Park is also a must-see. This urban park sprawls over 1,200 acres just north of downtown San Diego. It has 17 museums and cultural institutions, beautiful natural spaces, and the world-famous San Diego Zoo. Heading north along the coast will take you to the charming beach towns of Encinitas and Carlsbad in northern San Diego. A great stop-off point once you reach Orange County is Dana Point, which is known as the “Whale Capital of the West.” This area offers excellent whale-watching opportunities throughout the year. If you’d prefer to explore Dana Point on land, the harbor is a great spot for waterfront dining, shopping, and enjoying views of the coast. Less than 10 miles north is Laguna Beach, another must-see destination. This seaside resort town is known for its scenic beaches, an eclectic art scene, and vintage boutiques. To really experience Laguna Beach’s art scene, be sure to check out the annual Sawdust Festival, which brings together local artists and over 200,000 visitors each year. After heading north from Laguna Beach, Los Angeles is only about an hour away. From outdoor recreation to touring the heart of the entertainment industry, Los Angeles offers a busy itinerary. Be sure to head over to Venice Beach, which is known for attracting famous poets, artists, and musicians with its bohemian spirit. Rodeo Drive is also worth the trip, if only for the prime people watching. For those who prefer historical sites, Olvera Street in Downtown L.A. is a must-see. This historic district is home to some of the oldest buildings in the city, and it’s a great spot for traditional Mexican food. Before leaving Los Angeles County, hop on the Coast Highway and cruise through Malibu for some stunning coastal scenery. From Malibu, the drive to Santa Barbara is just over an hour and some of it offers beautiful views of the coast and rolling hills. The charming town of Ventura is a great halfway point to refuel, eat, and explore the coast. 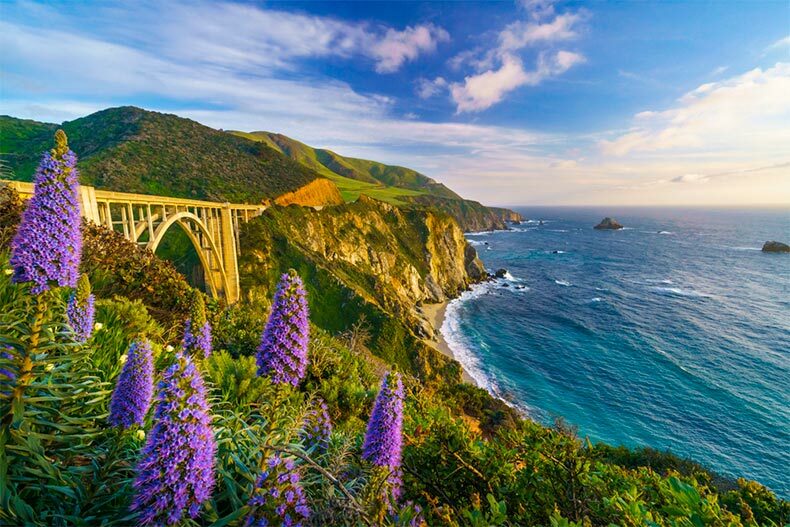 Bixby Bridge in Big Sur is one of the most scenic spots in California. With its small-town atmosphere and inviting beaches, Santa Barbara is where Californians head when they need a little rest and relaxation. It’s worth spending a couple nights in Santa Barbara to fully explore the area. For those who want to slow down and take in the sights, head to State Street Plaza. This pedestrian-friendly downtown district is home to vibrant eateries, art galleries, retail shopping, and more. The Santa Barbara Mission is also a popular attraction, especially for those interested in the Spanish Colonial period. Established in 1786, the mission now serves as a museum and an important historical landmark within the city. When you want to visit the beach, you don’t have to travel far. State Street leads directly to Stearns Wharf and the beach. For outdoor recreation, the nearby Channel Islands offer snorkeling, camping, hiking, and kayaking through sea caves. On the way to Big Sur, be sure to check out the coastal towns of San Luis Obispo and Morro Bay. These laid-back locales have their own unique charm that makes it easy to slow down and enjoy what traveling is all about. Heading to the Big Sur area will take you over the Bixby Bridge, one of the most photographed bridges in California—and for good reason. At about 280 feet high, it’s one of the tallest bridges of its kind and offers jaw-dropping views of the coast. There are many lookout points you’ll want to stop at, including McWay Falls, Ragged Point, and Pfeiffer Beach. A must-see location is Pfeiffer Big Sur State Park, which is home to California’s towering coastal redwood trees. Heading further north on Coast Highway will treat you to some of the most stunning coastal views California has to offer. Coast Highway eventually leads to the quiet coastal town of Carmel, which is known for its charming downtown area and beautiful natural scenery. It’s worth staying in Carmel for a day or two and exploring the surrounding area, including nearby Monterey. Popular spots in Monterey include the Fisherman’s Wharf and the world-famous Monterey Bay Aquarium. On the way to San Francisco, don’t miss a visit to Half Moon Bay. This quaint coastal town about 30 miles south of San Francisco is a hidden gem in Northern California, featuring white sandy beaches, a historic downtown, and scenic trails along the ocean bluffs. Avenue of the Giants is a must-see for anyone on a West Coast road trip. Crossing the Golden Gate Bridge is the perfect welcome to California’s most scenic major city, San Francisco. Once in San Francisco, there are so many ways to fill up your itinerary. Typical hot spots include the Fisherman’s Wharf, Golden Gate Park, Union Square, and the farmer’s market at the Ferry Building Marketplace. For book lovers, San Francisco is also home to some fantastic and historic bookstores. No matter your interests, San Francisco is a great city to just get out and explore. As you head north up the coast after leaving San Francisco, stop at Point Reyes National Seashore, which offers 71,000 acres of pristine coastal wilderness. You can explore the windswept beaches, hike the bluffs, and view wildlife. The remaining drive to Humboldt County is a bit long, but worth it. Once you reach California’s towering redwood trees, you’ll understand why: these massive trees grow to well over 300 feet and are the tallest in the world. 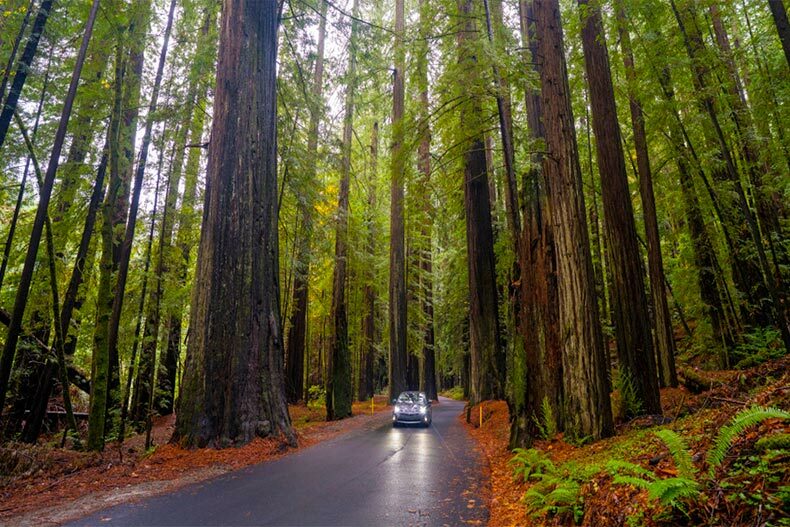 Drive along the 32-mile Avenue of the Giants in Humboldt Redwoods State Park to get an up-close glimpse of these magnificent coastal redwoods that can only be seen in California.